When you were growing up, did your family do anything special to celebrate Independence Day or other patriotic occasions? Did you hang a flag? What about neighborhood or town parades, picnics, neighborhood parties, etc.? Did you attend fireworks displays? 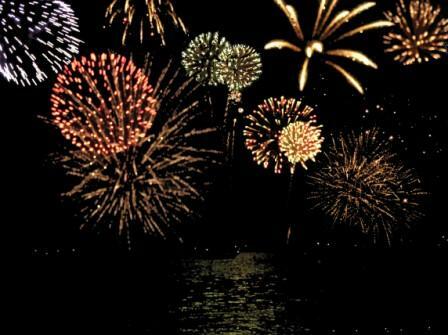 Were personal fireworks permitted where you lived and, if so, did your family do them? When I was a kid the fireworks displays were always spectacular. They were shot off from a barge out on Lake Coeur d’Alene (still are, I think) and everybody in town would line the beach (still do, I think). Gram and I almost always spent the 4th of July at the City Park and beach. Other assorted family members would join us. I would generally have plenty of cousins around to play with and tons of food to eat. Most of my memories of the day are a blur of sand and fried chicken and Orange Crush Soda, the fireworks and falling asleep in the car on the two mile ride home that seemed to take hours because of all the traffic. Only one year do I remember shooting off my own fireworks. My dad came and brought a ton of stuff with him, and my brother-in-law came and brought a ton of stuff with him. Most years my cousin Patty and I were just given sparklers to play with at the beach. Only later did I learn that the barge had caught fire, igniting all of the fireworks at once. The pyrotechnic guy was fished out of the lake minus one leg and suffering 3rd degree burns over most of his body. There was much talk then of discontinuing the show in future years, but they continue to this day. I haven’t seen the display in years, but the one here at Friday Harbor reminds me very much of it. I remember when I was about 5 years old and my parents took me to my first ever fireworks display. It seemed so magnificent and magical back then. I’m sure today fireworks can far outshine the ones from 40 years ago, but in my mind, none can be as breathtaking as the ones I saw as a kid. Wow, thanks for the great memories! I’ll be that was a great display when the barge caught fire, but it sure was awful about the poor guy getting so injured…Mmmm, orange Crush sounds so good! Have a safe and happy 4th! Crikey no wonder the show was spectacular – the poor man. I have never been a fan of fireworks since my brother managed to set off a whole box of them in the house! Thankfully no-one was hurt in this case. I love fireworks too. I’m always the one going ooooo and aaahhh with all of the little kids. Wow. And I thought my neighbors losing a finger was traumatizing! I loved reading this. Enjoyed your flashback. I still enjoy watching the fireworks, my hubby and I are planning on attending Sunday night after church. They have a nice little display here in our hometown. I love to go and watch the kids, their reactions and their faces. And I love messing with my camera trying to get some good shots. fireworks over the lake…reminds me of disneyworld…their fireworks are awesome, too! I’d like to celebrate 4th on the beach sometime, fun! I’d love to see fireworks over a lake one day. That’s awful about that poor man injured when the barge caught fire. Oh my goodness, what a horrible accident. Poor man. I love fireworks but sometimes we forget the danger that lurks behind them. You have a real gift as a story teller! I didn’t see that ending coming at all! 🙂 I remembered when Linda said one of her neighbors had been burnt that a boy I knew in school was hurt playing with fireworks too. Nothing like this memory though! Wow! Is that pronounced like FLAW or BLAH? I just had a Flaw-back to a Putrid Melon. And a Blah-back to a Cyclops. Hope you have a wonderul weekend. I wish Hawaii would pass the law to ban private fireworks. It’s caused such harm. The air is fouled for people with breathing problems and dogs go crazy. Why can’t we stop it? This is a great meme — it keeps me focused on the fact that I’m making my kids’ memories, right here and now. Hmm… need to come up with something for tomorrow!